Seattle named No. 1 city for bicyclists, but could they be priced out? Local bicyclists are dubious about the results, but one trend is clear: Better biking cities carry higher housing costs. A new study has crowned Seattle as the best city in the country for bicyclists. And while that’s already drawing scorn from some skeptical local cyclists, the results made one thing clear: If you want to live in a bicycling city, you’ll likely have to pay up. Zillow researched data on bicycle commutes and amenities for each of the nation’s 50 biggest cities to compile its first-ever ranking on the topic. Portland came in second and San Francisco was third in the standings, which the Seattle-based real estate company released this week. Portland actually had the most bicycle commuters and bike lockers per capita, but Seattle beat out its Pacific Northwest rival in other measures, such as the number of protected bike lanes. Looking at the list, researchers picked up on a theme: Cities that got top grades for bicycling also tend to have higher rents and home prices, including Washington, D.C., Boston, New York and the Los Angeles area. Meanwhile, the places at the bottom of the list — regions that had virtually no facilities for bicyclists — were almost all dirt-cheap, with Wichita, Kan. coming in last. In Seattle, rising rents and home costs have pushed some residents further out to the suburbs where bicycling is sometimes more difficult and takes longer, and there is concern among cyclists about whether they can truly afford to live in a biking city. And while bicyclists can save money by ditching their car, finding a bike-friendly home might cost extra. “There’s a premium for living with preferred modes of transit easily accessible: walking to work, biking to work, not having to suffer through a long driving commute,” said Zillow senior economist Aaron Terrazas. But he noted bicycling commuters also tend to have higher incomes. Cathy Tuttle, a Seattle bike activist who is the director of Seattle Neighborhood Greenways, said she’s noticed local real estate agents highlighting their homes’ proximity to bikeways in the same way they might have traditionally bragged about nearby freeway access. Although only about 4 percent of Seattle commuters are regular bicyclists, a city study in 2013 found that nearly 30 percent of adult residents — about 158,000 people — ride bikes at least occasionally. The top answer that respondents gave in the city survey for why they don’t ride more often is that they “don’t feel safe,” and even Tuttle said she doesn’t ride downtown for that reason. Zillow researchers found that it takes the typical Seattle cyclist 27 minutes to get to work, compared to 32 minutes on transit and 22 minutes driving. So is Seattle really No. 1? With so many groups pumping out similar lists in an attempt for publicity, it’s tough to tell which city is best for cyclists. Seattle in recent years has also been dubbed the No. 5 city for bicyclists (according to NerdWallet), No. 8 (Bicycling Magazine), No. 13 (Redfin), and even further down in other cases. Meanwhile, Washington has been named the most bicycle-friendly state eight years in a row by The League of American Bicyclists. The reports rely on subjective weighting of metrics, some of which can be confusing or even counterintuitive — and both Tuttle and Fucoloro said the design of Zillow’s study was flawed. 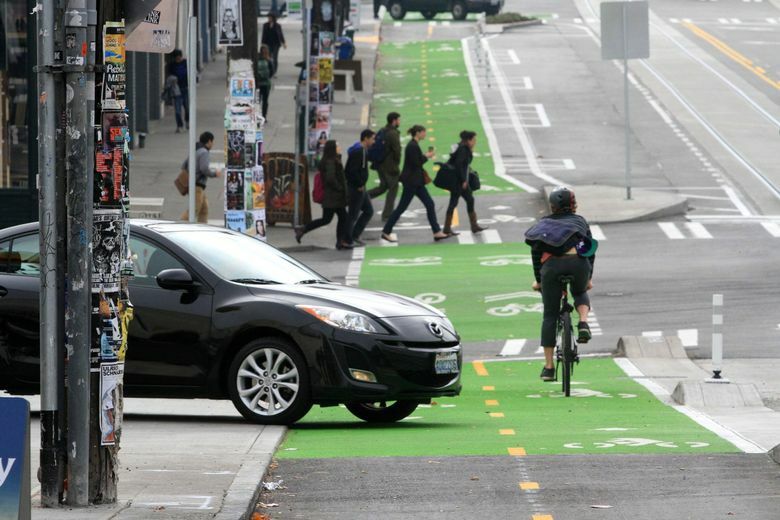 For instance, while the Zillow research factored in bike lanes that are fully separated from traffic, it didn’t account for the various other types of bike lanes that many bicyclists have to use more often. And the Zillow economists decided to give high marks for cities that had slightly longer bicycle commute times, based on their logic that these areas are nice enough that cyclists would be willing to withstand longer rides. Some other factors, such as crash rates, weren’t included at all.